Department of Pharmacology, JSS College of Pharmacy (JSS Academy of Higher Education and Research), Ooty - 643001, Tamil Nadu, India. 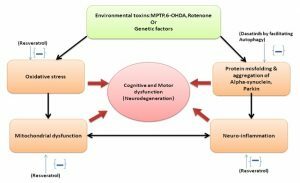 ABSTRACT: Neurodegeneration accounts for diseases like Parkinson’s disease, Alzheimer’s disease, Huntington’s disease, etc. that come under neurodegenerative diseases. Parkinson’s disease is the second most common neurodegenerative disease. The main hallmarks of Parkinson’s disease are progressive loss of motor control and cognitive dysfunction. Current treatments are of reducing the symptoms, do not address the long term complications like motor and cognitive dysfunction and have serious side effects as well. Recent research has linked tyrosine kinase activity dysfunction and mitochondrial dysfunctions to the main etiologies of Parkinson’s disease of familial and sporadic origin. Since Parkinson’s disease occur due to multiple etiologies, using a combination of drugs that target different etiologies could be an ideal strategy to address neurodegeneration. In the present study, the neuroprotective efficacy of a combination of tyrosine kinase inhibitor; dasatinib and natural antioxidant resveratrol were studied. Stereotaxic infusion of rotenone was given to rats to induce Parkinson’s disease, with nine treatment groups. The neuroprotective efficacy of the drug combinations was evaluated in different treatment groups by checking, behavioral studies, like learning and memory using radial arm maze, anxiety level using elevated plus maze and muscle grip strength using rotarod. The drug combination results were more inclined towards the sham control and found to be significant for all three experiments compared to rotenone group. Further, the results demonstrated that the drug combinations are potent candidates for rescuing the neurons from neurodegeneration. INTRODUCTION: Parkinson’s disease (PD) is one of the most common neurodegenerative diseases in the world at present which lies next to Alzheimer’s disease (AD). Gradual loss of cognitive dysfunction and motor disability are the main hallmarks of PD 1. Bradykinesia, rigidity, and tremor are considered as the most common symptoms of PD 2. The PD prevalence rate at present is 1-2 per 1000 of the population in the world 3. Degeneration of dopamine neurons in the substantia nigra is the main causative factor behind PD 3. 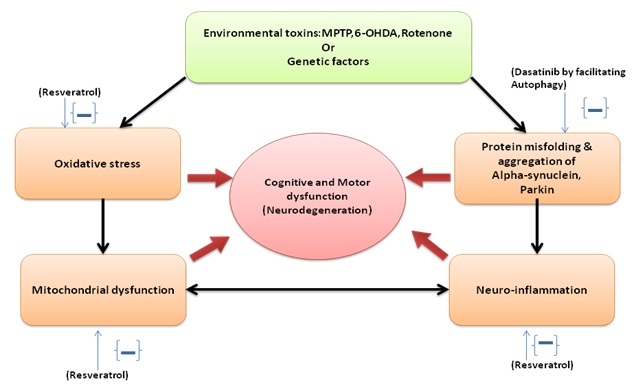 Neurodegeneration of dopamine neurons in PD occurs due to environmental factors, aging or due to genetic reasons 3. Also genetic reasons may drive both familial as well as sporadic incidents of PD3. Alpha-synuclein (a-synuclein) gene mutation is one of the major genetic factors responsible for PD pathogenesis 4. Misfolded a-synuclein leads to insoluble protein inclusions called lewy bodies and lewy neurites located either in neuronal cell bodies or neuronal processes that causes neurodegeneration 5. Recent research has strongly highlighted dysfunction related to kinase activities and phosphorylation pathways about PD pathogenesis 4. Inactive protein tyrosine kinase (c-Abl) can be activated by cellular stress and DNA damage, which causes increased reactive oxygen species (ROS) production and ultimately leads to dopamine neuron cell degeneration 6. There happens to be a link between c-Abl and a-synuclein in neurodegeneration, as c-Abl phosphorylates a-synuclein and impedes its clearance, whereas a-synuclein overexpression increases c-Abl activity, compromises autophagy and leads to lewy body formation 7. Ultimately, the formation of lewy bodies containing dysregulated a-synuclein contributes to oxidative stress, mitochondrial dysfunction and neuroinflammation, which are the other major etiologies of PD Fig. 1. Hence, drugs, in particular, the combination of drugs targeting c-Abl over-activity and phosphorylation as well as mitochondrial dysfunction seem to hold great potential in reducing the complications such as the decline in cognition and motor activity in PD. The currently using drugs such as levodopa (L-DOPA), dopamine agonists, monoamine oxidase (MAO) B inhibitors, anticholinergic agents, amantadine and catechol-O-methyl transferase (COMT) inhibitors, are not sufficient in terms of effectively addressing the long term complications like cognitive dysfunction and motor dysfunction8. In the current study we are using a combination of c-Abl inhibitor; dasatinib and a strong antioxidant; resveratrol and evaluate its efficacy in improving cognitive dysfunction by estimating learning and memory, motor dysfunction by evaluating motor coordination and also estimating the level of anxiety. Micro motor hand drill to make purr hole in the rat skull. Hamilton syringe- to inject rotenone in microvolumes into the substantia nigra and ventral tegmental area. Radial arm maze- to evaluate learning and memory. Elevated plus maze- to evaluate anxiety level. Rotarod- to evaluate muscle grip strength (motor coordination). Animals: The animals (Wistar rats; weight 200-250 gms) were collected from JSS College of Pharmacy animal house; IAEC clearance number (JSSCP/IAEC/OT/02/2018-19) and maintained standard laboratory conditions. The room temperature was maintained 20 ºC ± 2 ºC; alternating 12 h light-dark cycle. Food and water were given ad libitum. And the animals were housed in appropriate cages. Standard laboratory conditions were maintained with strict institutional guidelines. Stereotaxic Infusion of Rotenone: PD was induced to the animals using rotenone (3 µg/µl in DMSO) in dual sites; Right ventral tegmental area (coordinates; AP: -5.1 mm, ML: 0.8 mm, DV: -7.8 mm) and right substantia nigra (coordinates; AP: -5 mm, ML: 2.1 mm, DV: -7.7 mm), with the help of stereotaxic apparatus 9, 10. The rotenone-induced animals were given sufficient resting period of about two weeks for proper induction. Spontaneous Rotation Behavior: Rats receiving ST infusion were intensively observed for any abnormal activities during the first 72 h. One of the striking features following recovery from anesthesia was spontaneous circling. The animals were kept in transparent cages following surgery, and the spontaneous rotations in the cage were counted throughout one hour. Apomorphine Induced Circling Behavior: The animals were checked for PD induction using Apomorphine HCl (0.2 mg/kg sc), and contralateral rotations were monitored. Animals which showed more than 20 rotations / 5m were included for further study. Dasatinib: Dasatinib was dissolved in sodium acetate buffer and DMSO and makeup to 30 ml using sodium acetate buffer 11. Then it was administered to PD induced animals of different treatment groups in two doses; low dose (5 mg/Kg) and high dose (12.5 mg/Kg) 12. Resveratrol: Resveratrol was dissolved in DMSO (16 mg/ml) and water (1:1). Then, it was administered to PD induced animals of different treatment groups in two separate doses; low dose (2.5 mg/Kg) and high dose (10 mg/Kg) 13. L-DOPA/C-DOPA: L-DOPA and C-DOPA combination was used as a gold standard in the study and were administered to one of the treatment groups. L-DOPA/C-DOPA (100mg/10mg) was dissolved in water and given to the PD induced animals in the treatment group labeled as gold standard 14. Group 1: sham control animals with dummy lesion and no drug administration, Group 2: rotenone control- lesioned animals with oral vehicle administration, Group 3: gold standard treatment-lesioned animal with oral L-DOPA/C-DOPA treatment, Group 4: D1 group-lesioned animals with oral low dose dasatinib treatment, Group 5: D2 group-lesioned animals with oral high dose dasatinib treatment, Group 6: R1 group-lesioned animals with oral low dose resveratrol treatment, Group 7: R2 group-lesioned animals with oral high dose resveratrol treatment, Group 8: D1+ R1 group- lesioned animals with oral low dose dasatinib + low dose resveratrol treatment, Group 9: D2 + R2 group- lesioned animals with oral high dose dasatinib + high dose resveratrol treatment Table 1. Treatment Period: The animals in the different groups (1-9) were given treatment with the study drugs for 21 days. Behavioral analysis was checked post induction on days 0, 7, 14 and 21 of the drug treatment. Behavioral Analysis: The behavioral analysis was done to evaluate the efficacy of drug combination compared to individual drug treatments and the current gold standard in neurodegeneration associated with PD, by estimating the parameters like learning and memory, anxiety level and muscle grip strength. Learning and Memory (Radial arm Maze) Learning and memory is a parameter used to measure the changes in cognitive effects or memory status in animals due to the effect of study drugs. It is estimated with the help of an apparatus called Radial arm Maze 15. Apparatus: The radial arm maze consisted of eight arms which are of equal length (approx 4 feet long) and placed at a gap of equal distance, and all arms radiating from a circular central platform. The end of each arm consists of a food site, the contents of which are invisible for the animal from the central platform. Trial: For the first three days consecutively the animals were placed on the central platform for 15 min per day and allowed to explore the maze. The bait or food was reduced to four arms on the third day of habituation, and the session was ended when the animal finished visiting all arms. The animals were trained for further eight days following habituation. The trial continued until the animal had visited all eight arms or completion of 10 min time interval. Test: The animals were on food restriction overnight. During the test when the animal happened to insert only its head into an incorrect opening and stayed there for more than a minute, it was replaced at the center of the maze. Animals that were repeatedly choosing an adjacent arm or an arm that was only three arms away from the currently visited one were excluded from the current experiment because those animals were considered not to have acquired spatial memory. Ten minutes were allotted to each animal for task completion. Parameter: Behavioral performances were estimated by analyzing the total time taken for task completion by each animal in the radial arm maze. An arm was considered to be visited by the rat if it enters the arm by at least half of the body. The animal was considered to leave the arm if it keeps four paws in the central platform. Score: Decreased time for task completion = Improvement in learning and memory and better improvement in cognition. Anxiety (Elevated Plus Maze): Anxiety level is indirectly proportional to the level of dopamine concentration in the animal brain. Animals with sufficient dopamine level show better-controlled level of anxiety and vice versa. Hence, anxiety is a behavioral parameter that correlates with the level of dopamine in the rat brain. The level of anxiety was estimated with the help of an apparatus called Elevated plus maze 16. Apparatus: The elevated plus maze is a plus-shaped apparatus with two open (50 cm ´ 12 cm) and two enclosed arms surrounded by 50 cm high walls of the same dimension, in which the similar arms are opposite to each other. The middle segment is a square with dimension (12´12 cm), which allows transit for the animal from arm to arm. The maze was elevated 50cm from the ground. The lighting conditions were kept identical for each trial. It is based on the general avoidance of animals to open spaces due to anxiety. Trial: The trials were carried out under low light conditions. The animal was gently placed at the center of the maze facing the same open arm every time. The trials lasted for 5 min allowing sufficient time for each animal to explore the elevated plus maze. The maze was cleaned thoroughly with ethanol 30% between each animal trial and dried afterward. Test: The animals in the different treatment groups were tested for anxiety behavior in the elevated plus maze on days 0, 7, 14 and 21 of the drug treatment. Entries were counted when the animal had crossed all the four paws into one of the arms. Parameter: The average time spends in open and closed arms were noted for all the treatment groups with the help of a suitable device. Score: Increased time spends in the open arm is indirectly proportional to the anxiety level of the animal which correlates with brain dopamine levels. The animals with sufficient dopamine levels in the brain tend to spend more time in the open arm. Muscle Grip Strength-Motor Coordination (Rota Rod): The muscle grip strength and analyzing the balancing capacity of the rat are important parameters to estimate the muscle coordination in PD. These parameters can be estimated with the help of an apparatus called Rotarod. Sufficient level of dopamine neurotransmitter helps in better motor coordination and thereby gives better muscle grip strength 17. Apparatus: The Rota rod is a horizontally oriented rotating rod with a diameter of 7 cm, and it can rotate at varying speeds. It is low enough not to injure the animal, but high enough to induce fall avoidance in the rat. Rats normally try to stay on the rotating rod and avoid falling from the rod to the ground. The speed of a Rota rod can be adjusted. Trial: All the animals were exposed to a prior training session to get acclimatized to the Rotarod by undergoing a 5 days training program before they attain a stable performance in the rotating rod. The speed of the rotating rod was 15rpm on the first day of training and gradually reached 20rpm at the end of the training period. Test: The animal was placed on the Rotarod and average retention time for each rat in the rotating rod was evaluated. The cut off time was 180 sec, and each animal performed three separate trials with a 5 min gap between each other. The average time the animal falls from the rotating rod was noted and expressed as seconds per 3 min. Parameter: The length of the time that a particular animal stays on the rotating rod will be measured, and it correlates with the balance, physical coordination and motor planning of the animal. Score: The retention time of the animal in the Rotarod is directly proportional to the motor coordination capacity of the animal. Animals with better muscle coordination stay more time on the Rotarod. 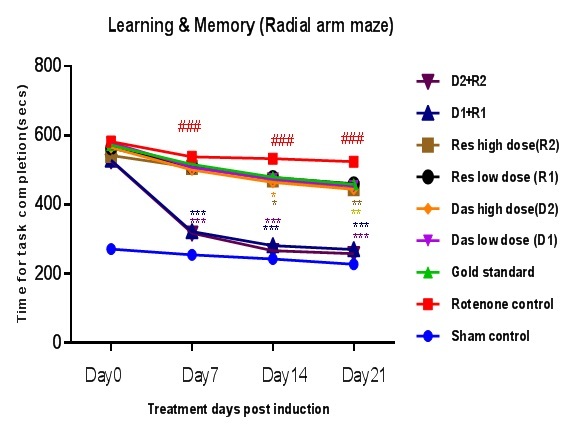 Effect of Drug Combinations for Learning and Memory on Radial Arm Maze in Rotenone Induced PD Rat Model: The effect of different treatments in rotenone-induced PD animals when tested with radial arm maze for evaluating the time taken for task completion is shown Fig. 2. The data reveals that the pre-trained rotenone control group showed a significant (p<0.001) increase in the total time taken for task completion when compared to the sham control group. The drug combination groups; low dose (dasatinib 5 mg/kg + resveratrol 2.5 mg/kg) and high dose (dasatinib 12.5 mg/kg + resveratrol 10 mg/kg) have shown significant (p< 0.001) decrease in the total time taken for task completion on days 7, 14 and 21 of the drug treatment, when compared to the rotenone control group. 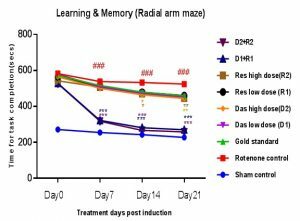 Effect of Drug Combinations for Anxiety on Elevated Plus Maze in Rotenone Induced PD Rat Model: The effect of different treatments in rotenone-induced PD animals when tested with elevated plus maze for evaluating the time spent in open arm of the elevated plus maze is shown Fig. 3. The data reveals that the pre-trained rotenone control group showed a significant (p<0.001) decrease in the time spent in the open arm when compared to the sham control group. The drug combination groups; low dose (dasatinib 5 mg/kg + resveratrol 2.5 mg/kg) and high dose (dasatinib 12.5 mg/kg + resveratrol 10 mg/kg) have shown significant (p<0.001) increase in the time spent in open arm of the elevated plus maze on days 14 and 21 of the drug treatment, when compared to the rotenone control group. Effect of Drug Combinations for Muscle Grip Strength on Rot Rod in Rotenone Induced PD Rat Model: The effect of different treatments in rotenone-induced PD animals when tested with a rota rod for evaluating the average retention time in the rotating rod of the apparatus is shown Fig. 4. The data reveals that the pre-trained rotenone control group showed a significant (p<0.001) decrease in the retention time in the rotating rod when compared to the sham control group. The drug combination groups; low dose (dasatinib 5 mg/kg + resveratrol 2.5 mg/kg) and high dose (dasatinib 12.5 mg/kg + resveratrol 10 mg/kg) have shown significant (p<0.001) increase in the retention time in the rotating rod of the rotarod on days 14 and 21 of the drug treatment, when compared to the rotenone control group. FIG. 2: EFFECT OF DIFFERENT TREATMENT GROUPS ON THE RADIAL ARM MAZE (LEARNING AND MEMORY). Two way ANOVA followed by Tukey multiple comparison tests; Values are represented as Mean ± SD (where n=6) ###P<0.001 sham control; ***P<0.001, **P<0.01, *P<0.05 compared with rotenone control. DISCUSSION: Dysregulated a-synuclein protein dysfunction and accumulation, mitochondrial dysfunction and neuroinflammation are considered as the main factors responsible for neurodegeneration in PD that contribute to long term complications like cognitive and motor dysfunction 18, 19. Research suggested that cognitive dysfunction such as learning and memory is a major long term complication in PD that involves brain areas like substantia nigra, prefrontal cortex, hippocampus and amygdala 20. The present study demonstrated that the drug combination was found to be effective in improving cognition as indicated by the improvement in the level of learning and memory. Anxiety is regarded as a common nonmotor psychiatric complication in PD that leads to a decline in the quality of life, increased level of care dependency and distress for the caregiver 21. Further, the dysfunction in dopaminergic transmission system seems to cause anxiety 22. The drug combination is effective in reducing the anxiety level based on the scores from the elevated plus maze experiment. Dysfunction of motor coordination is one of the most important reasons for motor difficulties affecting PD, which can affect almost all activities of daily life 23. In PD, degeneration of dopamine neurons in the substantia nigra, striatum, cortex, and thalamus account for motor dysfunction 24. The current study has revealed that the drug combination was found to be effective in improving muscle coordination as indicated by the scores for muscle grip strength obtained from the rota rod experiment. CONCLUSION: Since, PD is a progressive neurological disorder of multiple etiologies, using a combination of two drugs that target multiple etiologies of PD rather than alleviating only the symptoms could be a crucial approach for treating neurodegeneration. Instead of dopamine replacement therapy or maintaining the balance between dopamine and acetylcholine, the current treatment option of PD, our study demonstrates that dasatinib and resveratrol in minimal dose combination can be an ideal candidate for treating long term complications of neurodegeneration such as cognitive and motor dysfunction. Further, it is our prime hope that our drug combination can be a permanent solution for the long term complications due to side effects of levodopa. However, better neuroprotection could only be possible, should the drugs be given during the early stages of disease with the help of advanced diagnostic techniques and biomarkers. ACKNOWLEDGEMENT: The authors are thankful to the Institutional Animal Ethics Committee (IAEC clearance number (JSSCP/IAEC/OT/02/2018-19), JSS College of Pharmacy, Ootacamund, The Nilgiris, Tamilnadu, India, for sanctioning the animals for the study. Also, grateful to the Animal House, Department of Pharmacology, JSS College of Pharmacy, Ootacamund, The Nilgiris, Tamil Nadu, India. Ascherio A and Schwarzschild MA: The epidemiology of Parkinson’s disease: risk factors and prevention. Lancet Neurology 2016; 15(12): 1257-1272. Ole-Bjorn T and Anette S: Epidemiology of Parkinson’s disease. Journal of Neural Transmission 2017; 124: 901-905. Mehdi SJ, Rosas-Hernandez H, Cuevas E, Lantz SM, Barger SW, Sarkar S, Paule MG, Ali SF and Imam SZ: Protein kinases and Parkinson’s disease. 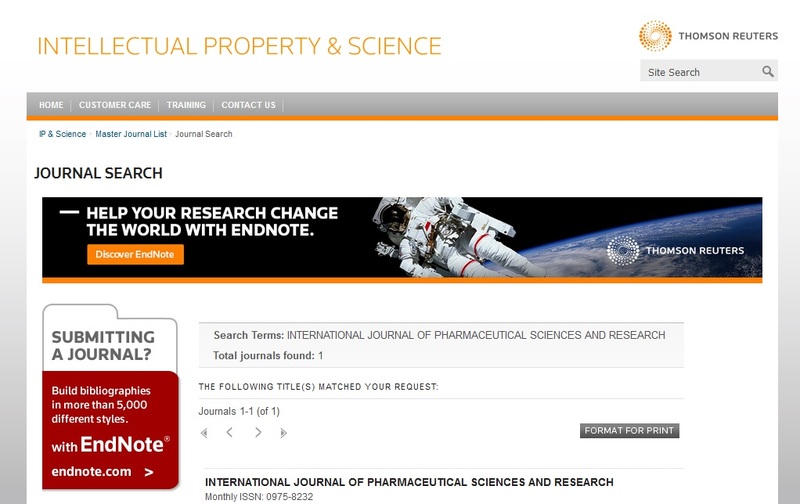 International Journal of Molecular Sciences 2016; 17(9): 1585. Taccioli C, Jesper T and Elia S: ParkDB: a Parkinson’s disease gene expression database, Database 2011: 007. Panjarian S, Lacob RE, Chen S, Engen JR and Smithgall TE: Structure and dynamic regulation of Abl kinases. The Journal of Biological Chemistry 2013; 288(8): 5443-5450. Mahul-Mellier AL, Fauvet B and Gysbers A: c-Abl phosphorylates α-synuclein and regulates its degradation: Implication for α-synuclein clearance and contribution to the pathogenesis of Parkinson's disease. Human Molecular Genetics 2014; 23(11): 2858-2879. Lindholm D, Pham DD, Cascone A, Eriksson O, Wennerberg K and Saarma A: c-Abl inhibitors enable insights into the pathophysiology and neuroprotection in Parkinson’s disease. Frontiers in Aging Neuroscience 2016; 8: 254. Paxinos and Watson: The Rat Brain in Stereotaxic Coordinates. 6th Academic Press 2007. Durdane A, Volkan S, Turker C, Ayfer M, Utku A and Oytun E: Neuroprotective effects of exenatide in a rotenone-induced rat model of Parkinson,s disease. The American Journal of the Medical Sciences 2017; 354(3): 319-324. Brian DF, Shuiying H, Ken-ichi F, Lie L and Alice AG: Contribution of Abcc4-Mediated Gastric Transport Absorption and Efficacy of Dasatinib. 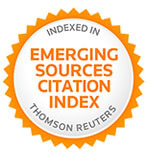 Clinical Cancer Research 2013; 19(16): 4359-4370. Vivek L, Neeraj S, Souvarish S, Adhithiya C and Huajun J: Involvement of c-Abl Kinase in Microglial activation of NLRP3 Inflammasome and Impairment in Autolysosomal system. Journal of Neuroimmune Pharmacology 2017; 12(4): 624-660. Navarro-Cruz AR, Ramirez Ayala R and Ochoa-Velasco C: Effect of chronic administration of Resveratrol on cognitive performance during aging process in rats. Oxidative medicine and cellular longevity 2017; 8510761: 1-8. Raymond TB, Dwaine E, Pam SB, Karen F and Heather SB: A pulmonary formulation of L-Dopa enhances its effectiveness in a rat model of Parkinson’s disease. The journal of pharmacology and experimental therapeutics 2004; 310(2): 828-835. Aiguo-Xuan DL, Jianhua L, Weidong J and Zhang M: Hydrogen sulfide attenuates spatial memory impairment and hippocampal neuroinflammation in beta-amyloid rat model of Alzheimer’s disease. Journal of Neuroinflammation 2012; 9: 1742-1751. Yashashwini YC: Evaluation of Learning and Memory enhancing activity of Coccinia grandis fruits in rats. Journal of Drug Delivery and Therapeutics 2018; 8(5): 430-436. Narasimhan KK, Jayakumar D, Uthamaraman S, Mohan T, Sathyamoorthy YK, Pannerselvam E and Periandavan K: Morinda citrifolia mitigates the rotenone-induced striatal neuronal loss in male Sprague-Dawley rats by preventing mitochondrial pathway of intrinsic apoptosis; Redox Report 2016. Panchanan M, Jayeeta M and Gary LD: Current understanding of the molecular mechanisms in Parkinson's disease: Targets for potential treatments. Translational Neurodegeneration 2017; 6: 28. Brahmachari S, Karuppagounder SS, Ge P, Lee S, Dawson VL and Dawson TM: c-Abl and Parkinson’s disease: Mechanisms and therapeutic potential. Journal of Parkinson’s Disease 2017; 7: 589-601. Nicola S, Alessandra BO, Gilberto F and Riccardo B: Understanding cognitive deficits in Parkinson’s disease: lessons from preclinical animal models. Learning memory 2013; 20: 592-600. Carlson-Hawke P, Brown B and Hammond S: Anxiety and its features in Parkinson’s disease. SM Journal of Neurology and Neuroscience 2017; 3(1): 1008. Zarrindast MR and Khakpai F: The modulatory role of dopamine in anxiety-like Archives of Iranian Medicine 2015; 18(9): 591-603. Magrinelli F, Picelli A, Tocco P, Federico A, Roncari L, Smania N, Zanette G and Tamburin S : Pathophysiology of motor dysfunction in Parkinson’s disease as the rationale for drug treatment and rehabilitation. Parkinson’s Disease 2016; 9832839: 1-18. DeLong MR and Wichmann T: Basal ganglia circuits as targets for neuromodulation in Parkinson disease. The JAMA Neurology 2015; 72(11): 1354-1360. Nair TA and Vadivelan R: Behavioral studies of dasatinib and resveratrol in rotenone induced Parkinson’s rat model. Int J Pharm Sci & Res 2019; 10(4): 2004-11. doi: 10.13040/IJPSR.0975-8232.10(4).2004-11. Authors Address: Department of Pharmacology, JSS College of Pharmacy (JSS Academy of Higher Education and Research), Ooty, Tamil Nadu, India.